The event is meant to give a sense of community to those quitting the church. Scott Sommerdorf | The Salt Lake Tribune The beginning of a group of about 200 people began their march from City Creek Park on Scott Sommerdorf | The Salt Lake Tribune About 200 people marched past the LDS Salt Lake temple after crossing North Temple Str Scott Sommerdorf | The Salt Lake Tribune A supporter takes a photo with Kate Kelly who later spoke on " Finding Joy in Aut Scott Sommerdorf | The Salt Lake Tribune About 200 people marched across North Temple Street on their way to the church office Scott Sommerdorf | The Salt Lake Tribune Stephanie Engle fills out her resignation letter during a rally and mass resignation f Scott Sommerdorf | The Salt Lake Tribune Kate Kelly, foreground, who later spoke on " Finding Joy in Authenticity" ma Scott Sommerdorf | The Salt Lake Tribune Jeri Carr spoke about "The Transition" at a mass resignation from the LDS ch Scott Sommerdorf | The Salt Lake Tribune Kate Kelly speaks on " Finding Joy in Authenticity" after a march past the S Scott Sommerdorf | The Salt Lake Tribune Twin sisters Ellen, left, and Jane Jensen read over their resignation letters prior to Scott Sommerdorf | The Salt Lake Tribune A couple holding hands were part of a group of about 200 people marching from City Cre Kate Kelly • Former leader of Ordain Women. 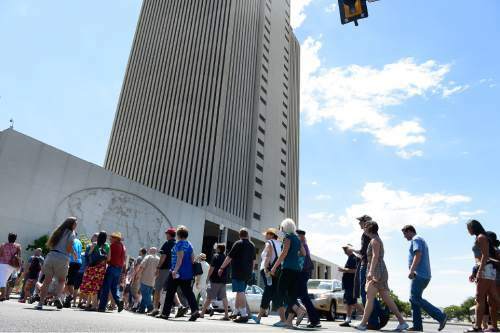 Scott Sommerdorf | The Salt Lake Tribune The beginning of a group of about 200 people began their march from City Creek Park on their way to the church office building to deliver their resignation letters, Saturday, July 25, 2015. 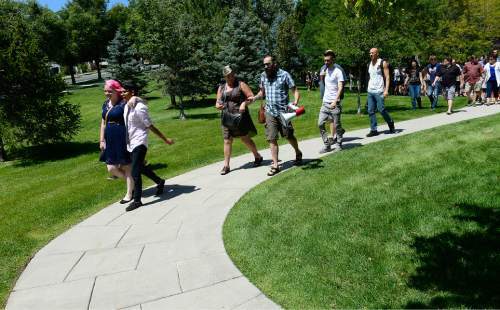 Scott Sommerdorf | The Salt Lake Tribune About 200 people marched past the LDS Salt Lake temple after crossing North Temple Street on their way to the church office building to deliver their resignation letters, Saturday, July 25, 2015. 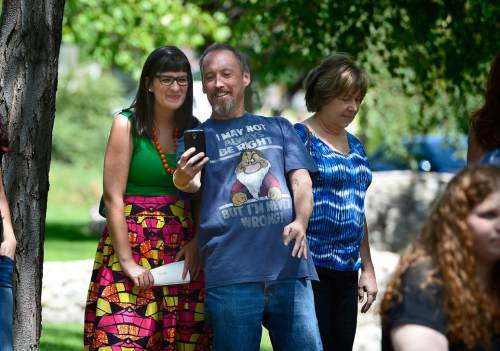 Scott Sommerdorf | The Salt Lake Tribune A supporter takes a photo with Kate Kelly who later spoke on " Finding Joy in Authenticity" at a mass resignation and rally, Saturday, July 25, 2015. Scott Sommerdorf | The Salt Lake Tribune About 200 people marched across North Temple Street on their way to the church office building to deliver their resignation letters, Saturday, July 25, 2015. 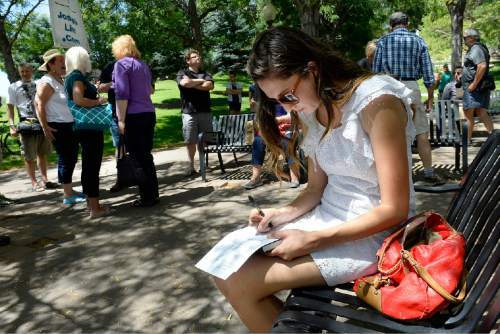 Scott Sommerdorf | The Salt Lake Tribune Stephanie Engle fills out her resignation letter during a rally and mass resignation from the LDS Church, Saturday, July 25, 2015. Later about 200 people marched to the church office buliding and back to City Creek Park. 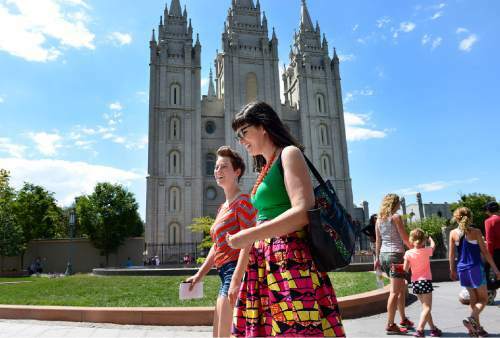 Scott Sommerdorf | The Salt Lake Tribune Kate Kelly, foreground, who later spoke on " Finding Joy in Authenticity" marches past the Salt Lake LDS temple along with others on their way to deliver resignation letters to the Church office building. Prominent dissident Mormons held a rally and mass resignation from the LDS Church on Saturday. 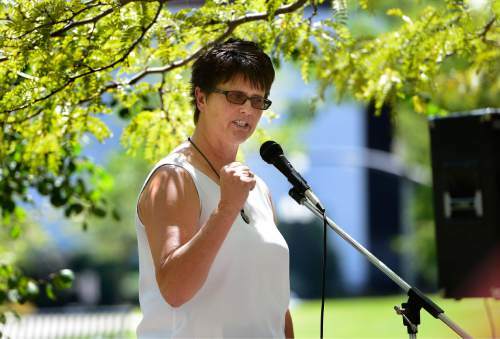 Scott Sommerdorf | The Salt Lake Tribune Jeri Carr spoke about "The Transition" at a mass resignation from the LDS church, and rally, Saturday, July 25, 2015. Scott Sommerdorf | The Salt Lake Tribune Kate Kelly speaks on " Finding Joy in Authenticity" after a march past the Salt Lake LDS temple along with others on their way to deliver resignation letters to the Church office building. Prominent dissident Mormons held a rally and mass resignation from the LDS Church, Saturday, July 25, 2015. 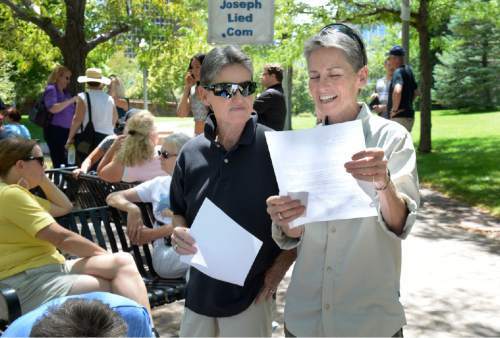 Scott Sommerdorf | The Salt Lake Tribune Twin sisters Ellen, left, and Jane Jensen read over their resignation letters prior to filling them out at a mass resignation and rally, Saturday, July 25, 2015. 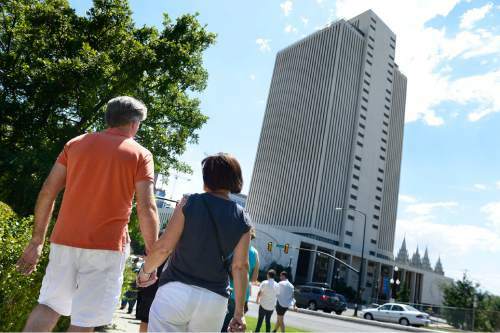 Scott Sommerdorf | The Salt Lake Tribune A couple holding hands were part of a group of about 200 people marching from City Creek Park on their way to the church office building to deliver their resignation letters, Saturday, July 25, 2015. Kate Kelly • Former leader of Ordain Women. When Logan resident Stephanie Engle was a teenager, she struggled with what she termed as the racism and sexism within the LDS Church. "I just thought this is so obviously not true," she said. "I can&apos;t keep claiming that I believe it." On Saturday, six years after ending her participation in The Church of Jesus Christ of Latter-day Saints, Engle took a final step to sever her ties with the Salt Lake City-based faith. 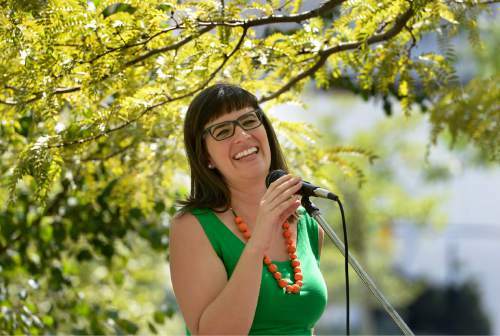 With a signed letter in hand, Engle joined with roughly 100 current and former Mormons  including Ordain Women co-founder Kate Kelly  at a mass-resignation event a block from the church&apos;s downtown headquarters. "Before we think about having children, I would like to have it done," she said of her resignation. "I came down for this [event] but also went to visit my parents, although they don&apos;t know I&apos;m here." 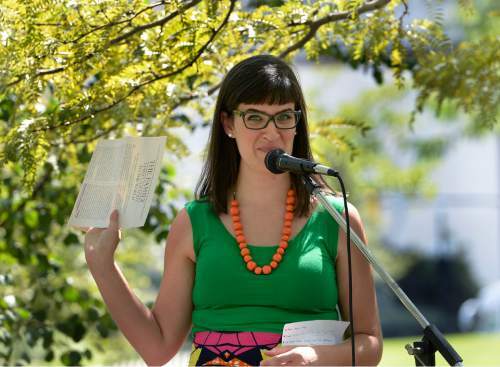 Organizer Brooke Swallow said the event  similar to other mass resignations staged from time to time  was intended to provide a sense of community for people leaving Mormonism. She said the resignations are not done out of anger nor to provoke the church, but to show a sense of dissatisfaction among church dissidents. "We know that it&apos;s a painful process," she said. "Some people are ostracized or they feel like they need to ostracize themselves from their Mormon families." After gathering at City Creek Park, participants crossed North Temple and State Street to deliver their resignation letters to the LDS Church Office Building. 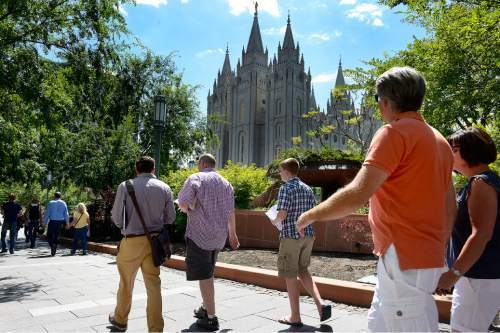 Because of noise from traffic, the group continued walking around Temple Square, briefly falling into disarray before regrouping at City Creek Park to hear remarks from speakers, including Kelly and former LDS bishop Earl Erskine, host of the online video series "Ex Mormon Files." Erskine said his withdrawal from the church began after he read an 1830 edition of the faith&apos;s signature scripture, the Book of Mormon, and noticed discrepancies with more recent printings. That inconsistency became a sticking point, he said, and opened him up to questions about other areas of church history  from the foundation of the religion to purported translations of Abrahamic texts. "I gave myself permission to think," he said. "Mormons, bless their hearts, they&apos;re very intelligent, but they don&apos;t critically think very much." He pointed to recent church essays as evidence that LDS leaders are scrambling to maintain order. "They&apos;re on the defensive," he said. These articles  confronting touchy topics such as the long-ago abandoned practice of polygamy, the former ban on black males holding the faith&apos;s priesthood, and Mormonism&apos;s view of mankind&apos;s divine potential  have earned praise even from critics for their evenhanded treatment of historical and doctrinal issues. Kelly, who was excommunicated from the church last year after advocating for the inclusion of women in the all-male LDS priesthood, said that Mormons should stay in the faith if it brings them joy, and leave if it doesn&apos;t.
"If you stay, you should raise hell," she said. "I think you have a moral imperative to make it a better place for children and especially for girls." In a statement, church spokesman Dale Jones said: "Every person is valued and loved. They are our brothers and sisters, colleagues and friends. Each makes their own decisions about their participation and church membership. Regardless of their choice, we love them and wish them well, and hope they will find the support and answers they seek." Several speakers mentioned that they have tried, unsuccessfully, to resign in the past, only to have LDS leaders deny their requests. Brent Parkin said he resigned three months ago after protracted discussions with the lay bishop of his Mormon congregation. He described participants of the mass resignation  which took place the day after Pioneer Day, a celebration of the Mormon settlers&apos; arrival in Utah  as pioneers at the early stages of what will be a mass exodus of disaffected Latter-day Saints. "The house of cards," he said, "is falling down."